This Plastichrome postcard features one of the scenic outlooks at historic Hoover Dam, which is located on the border of Nevada and Arizona. 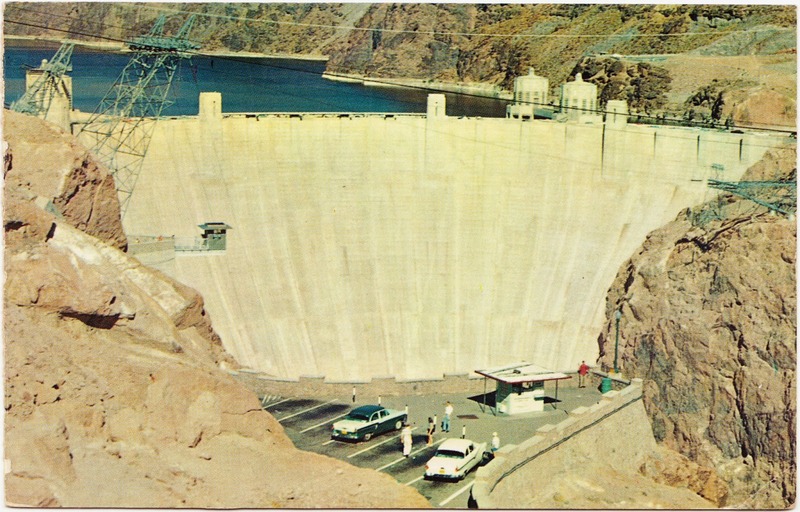 "HOOVER (BOULDER) DAM — ARIZONA — NEV. Harnessing the mighty Colorado River to dorm Lake Mead and provide power for the entire Southwest is one of the world's proudest engineering achievements. The spectacular tourist viewpoints are prominent in this picture." That address was probably not sufficient for 1967, given that it was four years after ZIP codes were instituted by the United States Postal Service. It might or might not be a coincidence, but the cancellation stamp used on the postcard states: ALWAYS USE ZIP CODE. "I am a little late with this card, But I made sure to send one, but I also hope that you get it because I do not know your address, and I misspelled your Mohnton. 1. Also on May 1, back in 1840, the Penny Black — the world's first adhesive postage stamp — was issued in Great Britain.